A scene from the big school reunion in 1982. Canada’s 150th anniversary is coming up next year, and two celebrations are planned in Moosomin to help mark the occasion. A grand opening celebration for the Tim Hortons Heritage Park is set for Friday, June 23, 2017 as part of Canada 150 celebrations, and a local committee has come together to plan a massive school reunion and homecoming for Friday and Saturday July 7 and 8. The homecoming will coincide with the 2017 rodeo weekend. Heritage Park is being developed within the Bradley Park sports grounds and will include a park area, a permanent stage, picnic tables, and a playground. It is being developed next to the new PotashCorp Sportsplex, which will open this fall. The opening of the park will include an event over the noon hour hopefully involving the school students, kids entertainment, and evening barbecue and different events in the park. “Our concentration is the park and the Canada 150, and I thought it would be important to include the school,” said Moosomin recreation director Mike Schwean. The reunion and homecoming committee is being co-chaired by Sinc Harrison and Marg Tomlinson. The organizers are hoping to attract many former residents back for the weekend, and replicate the success of a massive homecoming that was held in 1982 to mark the community’s 100th anniversary. Both Sinc and Marg were part of the committee that organized the 1982 reunion. The 2017 homecoming and reunion will mark the 135th anniversary of Moosomin’s schools, as well as Canada’s 150th. Organizers are hoping individual classes from McNaughton High School will organize their own reunions to be part of the weekend. Organizers decided to hold the reunion on the same weekend as the rodeo in a bid to help make both events a success with classes attending the firemen’s pancake breakfast, participating in the rodeo weekend parade, attending the rodeo and the dances. “My class was tossing around the idea of doing a reunion next year, because it will be 50 years since we graduated,” said Marg. A planning meeting is set for July 26 at 7 p.m. in the Communiplex lobby. 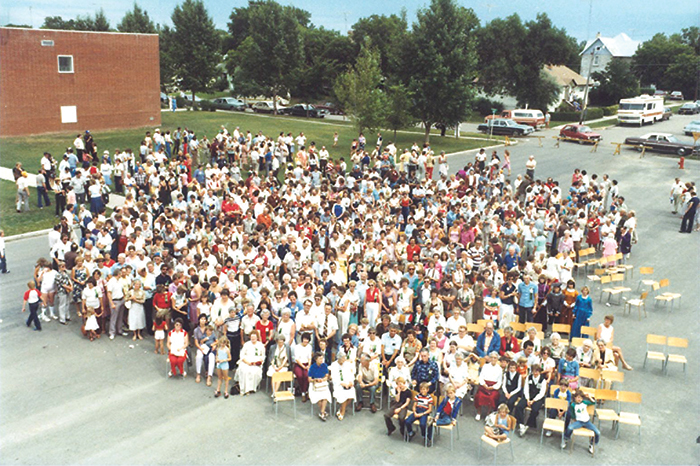 Organizers are hoping that reaching out to former Moosomin students and former residents will be easier for this reunion than in the past. “In ‘82 we didn’t have Facebook or any kind of electronic communication,” says Sinc. “In ‘82 we sent out over 3,000 invitations,” adds Marg. “Brenda Ireland and I spent two years going through school registers and finding addresses and looking for people. She said that some of those people had been asking if anything is planned in Moosomin for Canada’s 150th anniversary. Sinc suggested the weekend would be a good time for families to plan get-togethers as well. “I think our kids will all come home, so there might be some family reunions that weekend as well. It will be a good time to get together. “I think the big thing is to nail down the date, and let people know about it, and I think we should get 2,000 people easy. The organizers will be looking for a prominent former Moosomin student to speak at the reunion. “There are all kinds of people from Moosomin who have contributed greatly to the world,” said Sinc.